Disease is an impairment of health or a condition of abnormal functioning. 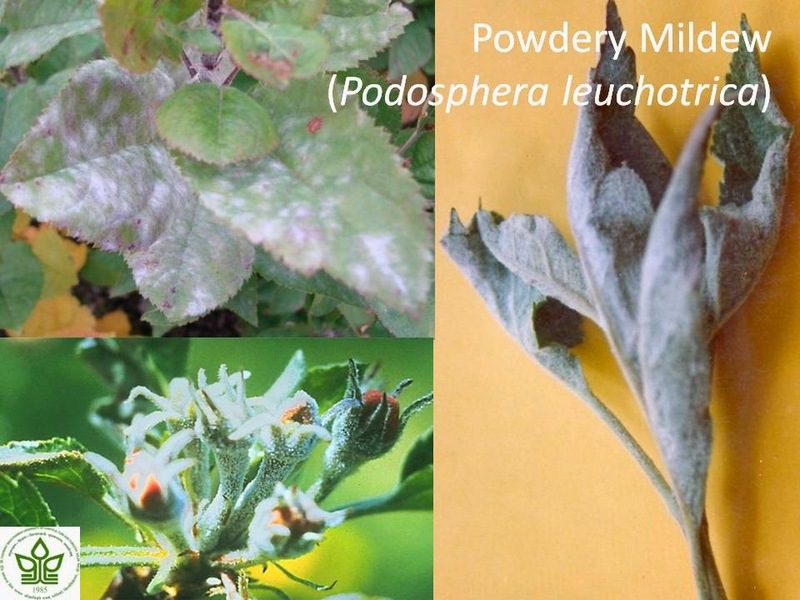 In this post we are going to talk about the powdery mildew disease of apple. This disease is very common in Kinnaur district of Himachal Pradesh as dry weather plays an important role in the appearance of the disease. Description: The disease infects leaves, blossoms, green shoot, and the fruit. On the leaves, the fungus can appear as felt-like patches or as a solid mat on the surface, particularly on the undersurface of the leaf. Initial infections on the underside of the leaf may cause chlorotic patches or spots to occur on the upper side of the leaf. This symptom, however, is not unique to powdery mildew so inspection of the underside of the leaf is necessary to confirm that powdery mildew is the cause of these symptoms. Under favorable environmental conditions, the disease spreads over the entirety of the leaf and progresses down the petiole on to young, green shoots. Infected leaves tend to crinkle, curl, or roll upwards along the edges giving them a narrow appearance. If the infection is severe, infected leaves will usually drop prematurely during the summer. Shoot infections are the typical result of overwintering infections of the fungus in buds. When the terminals push in early spring, the fungus grows along with the new succulent growth and infects this tissue immediately. These shoots may be killed outright in the spring, or may survive throughout the season and die in late fall or winter. The initial growth of the fungus on newly infected twigs appears powdery white but eventually turns a darker brown. Small black fruiting bodies, called cleistothecia, can appear in the mycelial mat and function as the source for sexual reproduction and the eventual production of ascospores. The blossoms, petals, sepals, receptacles, and peduncles may become infected and covered with the fungus. Blossom infections are less common but are important because infected blossoms will either fail to set fruit or produce small, stunted and/or russetted fruit. These fruit are unmarketable for fresh market consumption.